Comicbooks have a long history of imaginary stories. Or, well, more imaginary than usual, I guess. Stories set outside the normal continuity, in which anything could happen. Superman would look into a Kryptonian dream machine or some crap, and see what would happen if he was never sent to Earth or if he married his high school girlfriend. As a firmer, ongoing continuity was developed in comics, the imaginary stories fell by the wayside. But there was still a demand for tales like this, so DC started the Elseworlds line, which examines their characters in a different setting. In Elseworlds, heroes are taken from their usual settings and put into strange times and places - some that have existed, or might have existed, and others that can't, couldn't, or shouldn't exist. And while the premise is that any character can be re-examined in one of these stories, most of the time it turns out to be Batman and his entourage. The 3-issue Thrillkiller series was one of these, showing us a world where Bruce Wayne's parents were murdered not by a thief in the night, but by their own servants. Bruce lost his inheritance, and without the funds to back up his crusade, fought crime by joining the (predictably corrupt) Gotham police force. In this world without a Batman, it was bored heiress Barbara Gordon who patrolled the night. Thrillkiller Batgirl has long been a project for customizers, so it's nice to finally get a real version. Thrillkiller was set in the '60s, in a world suspended halfway between smoky beat poets and swinging lounge parties, and Batgirl's costume reflected that. 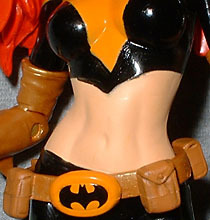 She was sporting a bare midriff long before Huntress had the idea, and traded the real Batgirl's high yellow boots for matching cocktail gloves. Her stylized bat symbol stretches all the way across her chest and around to her back (a difference from the comic, where it stopped on her shoulders), and she's got yellow bat kneepads. Art for the series was provided by Dan Brereton, but the sculpt isn't as dead-on accurate as, say, the Kingdom Come figures. The women of Thrillkiller had figures suiting the era, which is a nice way of saying they all looked a little heavy - the figure, however, is noticably trimmer. Despite that, you can definitely see the influence of Brereton's blocky paintings in the final figure. The hair and face, particularly, seem to hew closely to the source material. Her hair seems perpetually blown by some small wind, and her mask's bat ears poke up through those red locks. The paint on Thrillkiller Batgirl is very nice. Brereton used a vibrant orange-red to contrast Gotham's shadows, and that's what we got for her hair. The yellows of her costume are more muted, nearly gold, while her batsymbol is tinged orange. Again, this was a feature of the original art, so while a true yellow might have stood out better, it would have been wrong. Black on the figure is glossy, giving the costume the look of leather. The line between her stomach and her costume can get a bit messy, but nowhere near as bad as some recent DCD figures. Articulation is unsurprising. Batgirl has all the normal DCD joints, which means she's decently mobile but is still limited to just a few poses - there's only so much you can do with knees, hips, elbows, shoulders and neck. Still no waist on the figure, but she does move at the biceps, where her gloves meet her arms. That's a handy bonus. Batgirl really only has one accessory, though she could easily earn a few bonus points in that category, depending on how generous you feel. The figure includes a small batarang in the same yellow as her costume, and she can hold it well in her left hand; with the biceps, you can manage a so-so throwing pose. Her utility belt is a separate piece, floating around her waist. It's not removable, but the fact that it's not just sculpted on is nice. All the Elseworlds figures come with a display base, a black and red version of the Elseworlds logo. Rather than just a generic piece, however, the base has the specific figure's name printed on it: that helps give these figures the feeling of art pieces, and shows a bit more care on DC's part than just plain re-uses. Batgirl's base is 4 1/2" wide by 2 1/2" deep, and she's got a hole in her right foot for the peg, which is a molded piece - a lot of DCD bases lately have used removable pegs, but those tend to get stuck in the figures' feet. Thrillkiller Batgirl is a very nice figure, with a cool design and average playability. There aren't really any major paint problems to worry about, and while Batgirl isn't quite as full-figured as she was in the book, she doesn't look like a Michael Turner design, either. Thrillkiller was one of the better Elseworlds stories, and this is a great representation of the main character. What's your favorite Elseworlds take on Batgirl? Tell us on our message board, The Loafing Lounge.